See scan - absolutely perfect / mint condition. This is a nice and rare Imperial / Royal Russian sterling silver vodka beaker / goblet. The beaker has engraved town scenes from Moscow and something that looks like the Kremlin. The cup measures about 43 mm tall and 40 mm in diameter at its edge part. 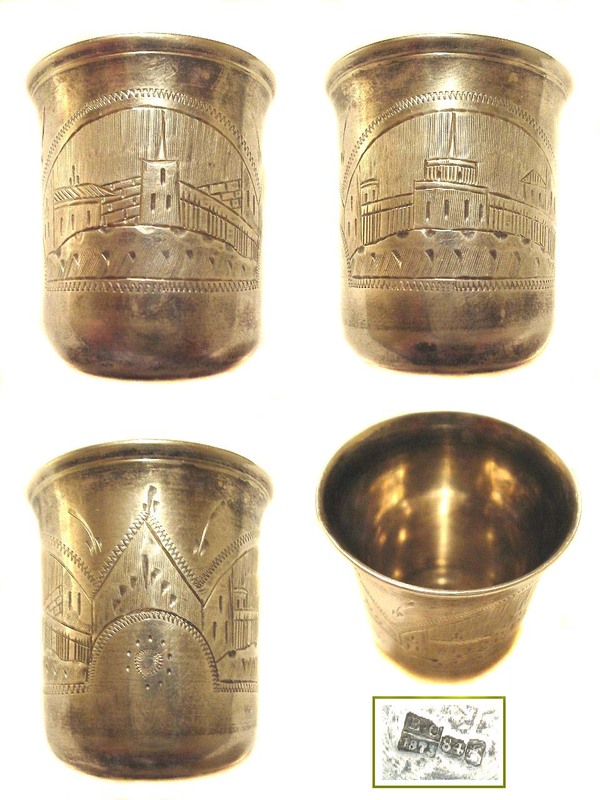 The beaker was made / crafted by the Russian Imperial Moscow silver assay master Viktor Savinkov (1855-1888) and is marked / hallmarked and dated at bottom of the cup - V.S. (in Russian), as well as 84 for the silver content. Victor Savinkov is considered as one of the famous Russian silverwear and jewelry master of his time along with Faberge and others. Nice and rare collector piece and one of the nice Russian beakers and pieces of silverwear.